Though his approval ratings have dipped, President Obama leads all of his Republican challengers in the battleground state of Virginia, according to a new poll from Public Policy Polling (D). The president leads former Massachusetts Gov. Mitt Romney, 47 percent to 43 percent, but that margin has shrunk by seven points since the last PPP poll, released in May. The president leads the other Republicans included in the survey by more sizable margins. He beats Minnesota Rep. Michele Bachmann and Texas Gov. Rick Perry, who hasn't yet entered the race, by nine points. He tops businessman Herman Cain by 11 points and former Alaska Gov. Sarah Palin by 14 points. Additionally, the favorability ratings for each of the Republican hopefuls are under water. Thirty-four percent of Virginia voters have a favorable opinion of Romney while 49 percent do not. Similarly, 30 percent have a favorable view of Bachmann and 49 percent have an unfavorable view. Only 25 percent have a favorable opinion of Perry while 35 percent have an unfavorable one. And 40 percent of voters say they are not sure about the Texas governor. The survey also shows that President Obama has lost ground in Virginia. 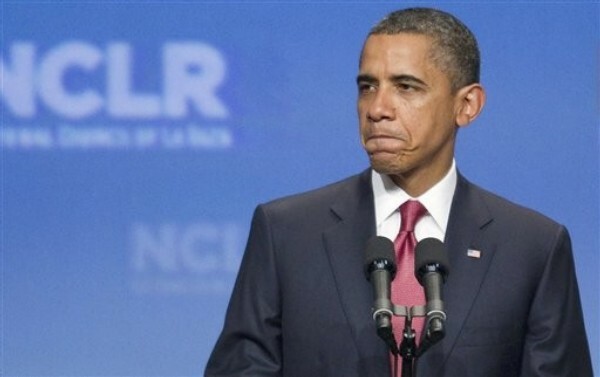 According to the poll, 47 percent of voters approve of the job Obama is doing as president while 48 percent disapprove. In May, those numbers were 51 percent to 44 percent. Obama's ratings are better among independents: 48 percent approve while 42 percent do not. He receives strong support from his Democratic base and strong opposition from Republicans. More women (52 percent) approve of the president than do men (41 percent). In 2008, Obama became the first Democratic presidential candidate to win the swing state since Lyndon Johnson in 1964. Old Dominion voters chose Obama over John McCain by six points. But since then, the governorship turned Republican along with several U.S. House seats. In addition to being the site of what could be a fierce presidential battle, the 2012 Senate race there -- likely to be between former Govs. Tim Kaine and George Allen -- figures to be one of the most competitive and expensive contests in the country. For this poll, PPP surveyed 500 Virginia voters from July 21-24. It has a margin of error of plus or minus 4.4 percent.